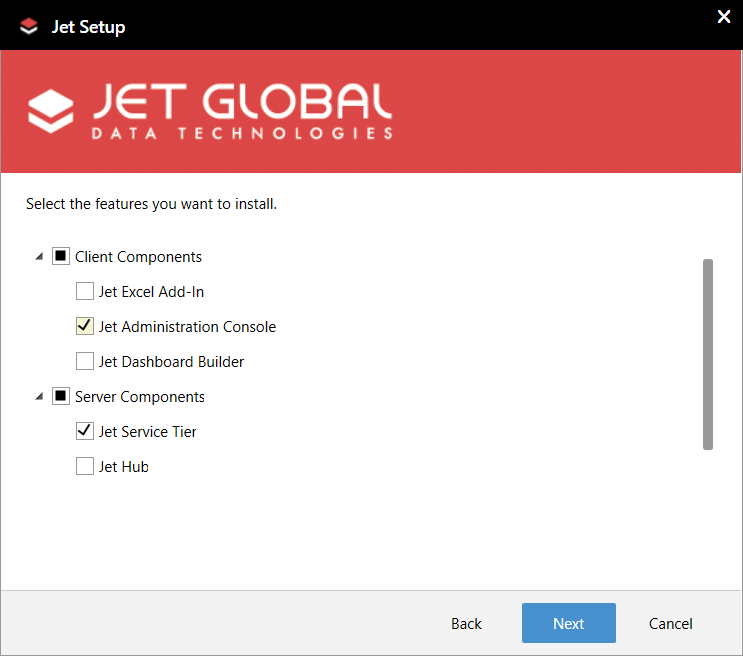 This article describes how to install the Jet Service Tier (including the Jet Configuration Service) for use with the Jet Excel add-in, the Jet Web Portal, and the dashboard features of Jet Analytics (2017 and later). This video provides a step-by-step overview of Installing all of the Jet Reports components. 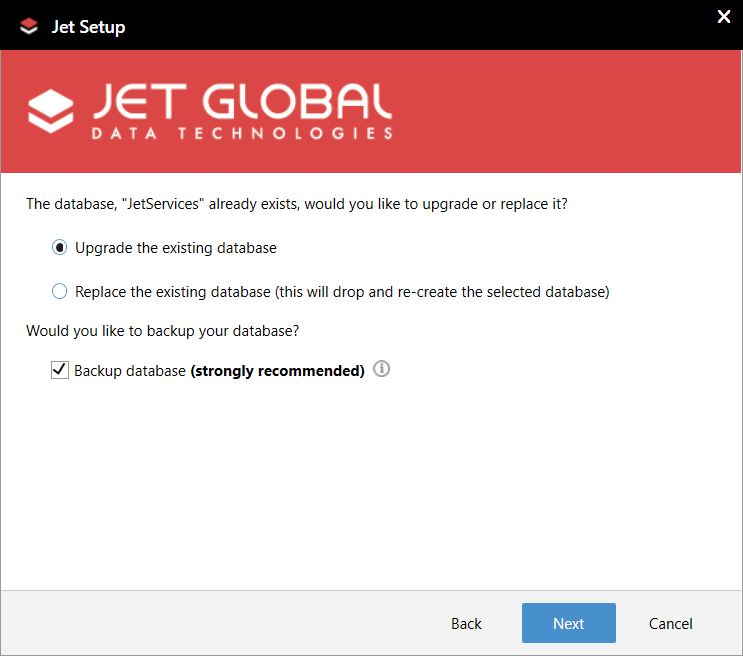 If you are using Centralized Settings with Jet 2012 R2 or an earlier version, you will need to upgrade your Centralized Settings database using the Jet Configuration installation for Jet 2013 before your users upgrade to newer versions. The prior Centralized Settings database is not compatible with newer versions. See the section Upgrading from Centralized Settings (below) for details. If you are using the Jet Configuration Service for Jet 2015 Update 1 or earlier , your settings database will be upgraded for use with new versions Users of Jet 2015 or earlier will *NOT* be able to access the settings in this database. The Services Database resides on a SQL server instance and stores information about data source connection properties and scopes, users, and user permissions. The Jet Service Tier enables communication between the clients and the Services Database. This communication is encrypted as a security measure. The Jet Administration Console – a graphical user interface that makes it easy for administrators to manage the information in the Services Database. 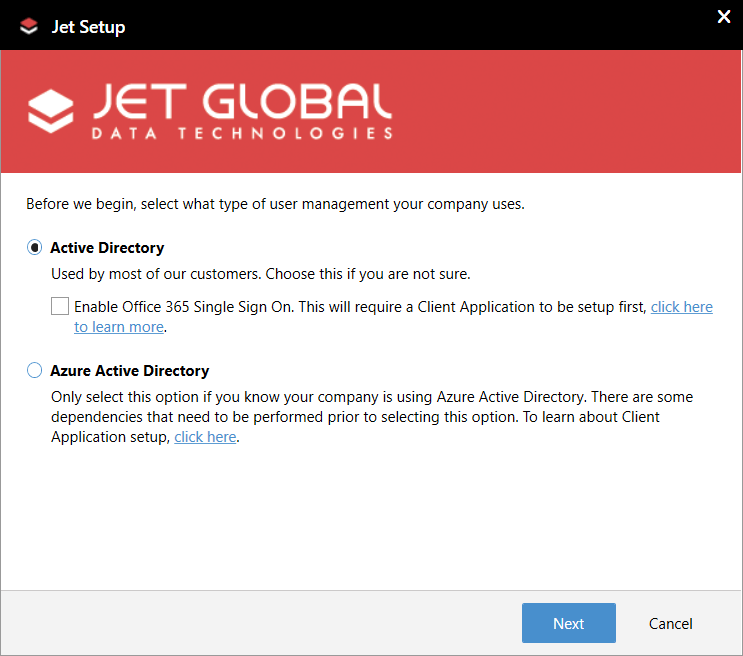 Note: the Jet Setup file cannot install the Services Database on an Azure server. To install this database on a server that is on Azure, please refer to the “JCS Azure configuration” folder in the product download. After downloading and extracting the contents of Jet Reports installation zip file from the Jet Global website, find and run Jet Setup.exe. Select only Jet Administration Console and Jet Service Tier (deselect the other options). Select the Run As account which you want to use to run the Jet Service Tier. If you elect to use a different account and that account has a password, you will want ensure that it does not change regularly (as the Jet Service Tier will have to be uninstalled and reinstalled each time the password changes). Next, specify the server name where the Service Tier is to reside and the port number that will be used to communicate with it. 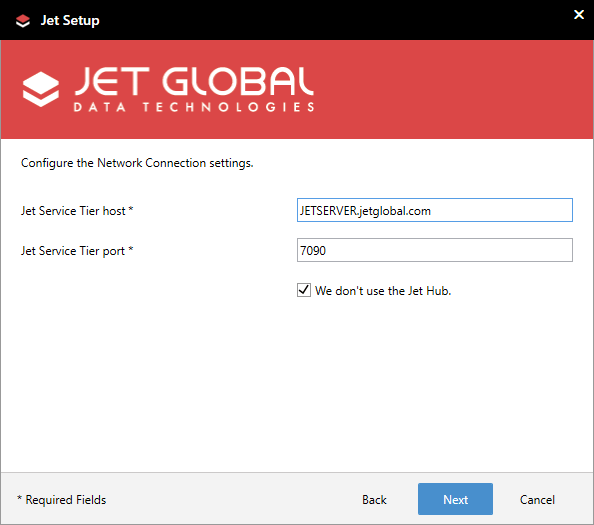 We recommend that you use the default port of 7090 as this matches the default port that is defined in the Jet Application Settings and will make it easy for users to connect to the service. Enter the name of the SQL Server Instance and provide a name for the Services Database. Select either to log in to the database using the "Run As" account (specified on the previous screen) or provide the username and password for a different database user. 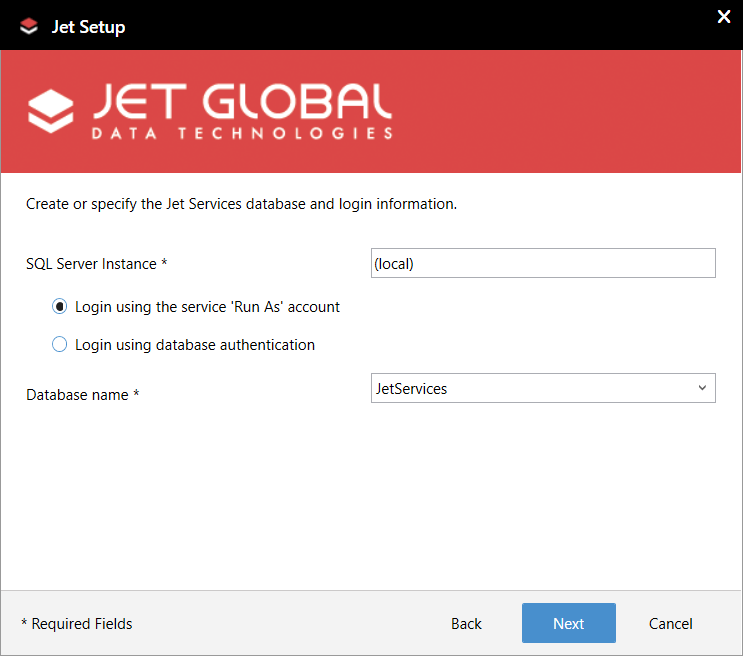 This is the account that the Jet Service Tier will use to login to the Services Database, and as such must have access to the Microsoft SQL Server. If you already have a database with the name you specified on the previous window, you will need to decide if you want to upgrade or replace that database. Whichever choice you make, it is strongly recommended that you select to back up that database before proceeding. The setup program is now ready to make changes to your system. If prompted, select Yes to allow the program to make changes to the system. 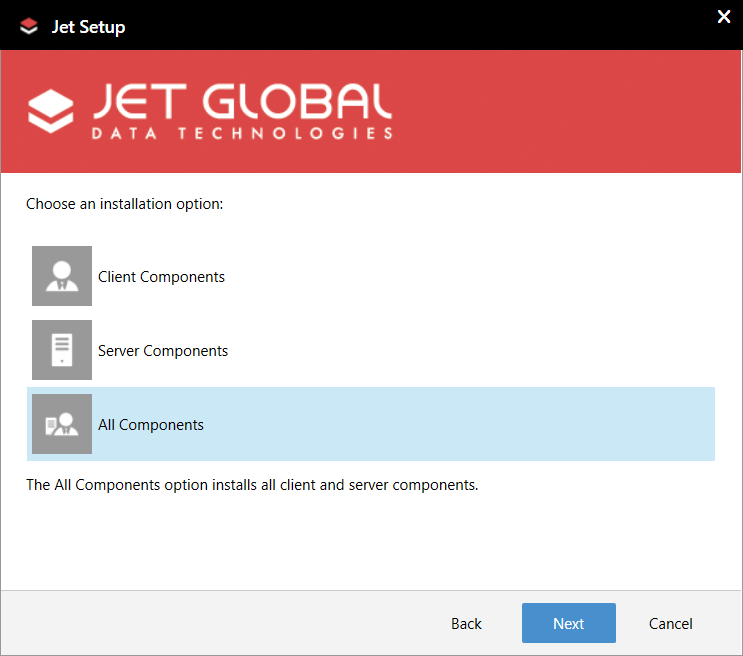 If you did not previously use the Centralized Settings feature with an older version of Jet Essentials, your installation process is now complete. In some cases you may want to change how the Jet Service Tier connects to the Services Database. This requires stopping the Jet Service Tier, and restarting it with new command line arguments. The port specified above must be the port used by the service tier, not the port used to connect to the database. When installing the Jet Service Tier, the service account specified needs to have write access to the Jet Services folder in the Program Files directory. 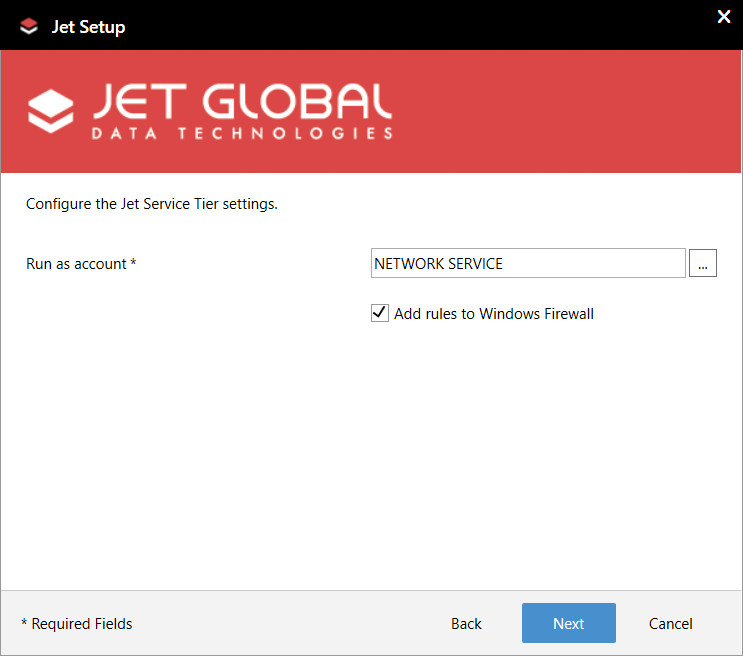 This permission is given by the Jet Service Tier installer unless the user account that runs services has been changed from the default. In this case, the permission will need to be given explicitly.